A very basic retired mustering hut on the Swin River South Branch, near Lake Heron, and popular with hunters. 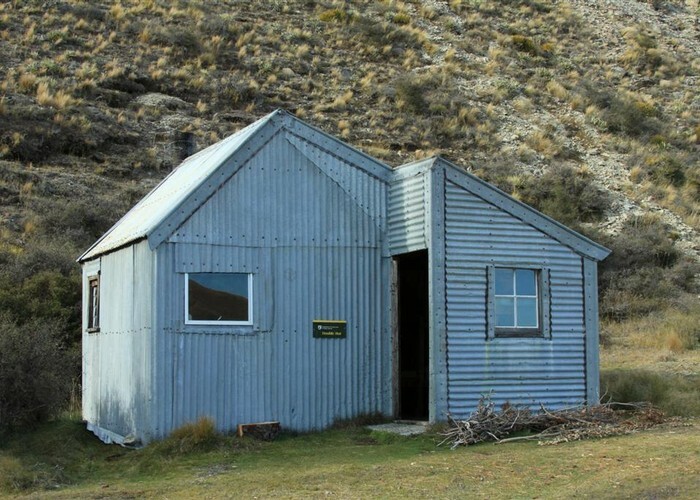 The hut is located on the Te Araroa Trail southwest of Clent Hills Saddle. The hut was likely built between 1902 and 1906, although huts are mapped on the site as far back as 1889. A lean-to was added in the 1930s. Double Hut • By unspeakableoutrage. Licence: cc by-nc-nd. From the south, the Stour Track leads in from Ashburton Gorge Road at the Stour River. From the west, a route leads around Lake Heron and up the Swin Stream. This route starts where the Hakatere Heron Road first meets Lake Heron. The Te Araroa Trail passes the hut, running from Jacobs Stream on the Hakatere Heron Road over Clent Hills and Turtons Saddles out to Double Hill Run Road, next to the Rakaia River. Added 9 September 2007 by mrtotsmrtots. 3 revisions, most recently 9 March 2014 by MatthewMatthew. 355 views in the past year (30 per month).